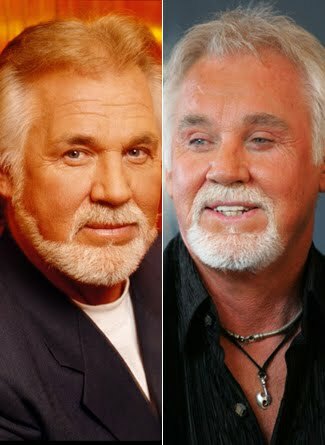 Kenny Rogers before and after plastic surgery. 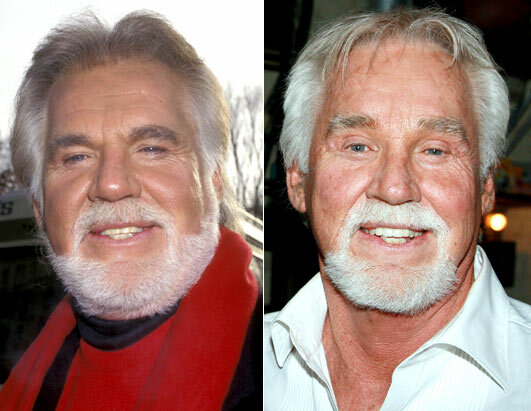 Lets take a close look at the nearly unrecognizable face of great American country music singer, Kenny Rogers, and the plastic surgery procedures which he ultimately regretted. 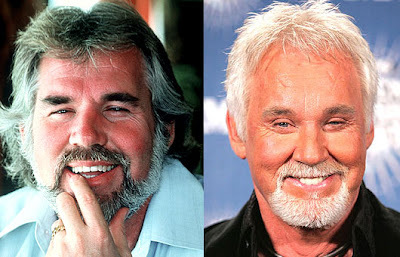 About a decade ago, Kenny Rogers married a woman who was 29 years younger than himself and has since admitted to feeling pressure to stay young after doing so. However Kenny has candidly admitted that those efforts via plastic surgery were all but regretful after the operation was completed. "I kind of wish I hadn't done it. Looking back at some pictures of myself, my eyes were a lot warmer than they are now, and I miss that. "They have settled in a lot and they're not as bad as they were right after surgery. It is believed that Kenny Rogers has undergone such plastic surgery procedures as a facelift, eye lift, brow lift and botox injections. I didn't want to be an old man with this young girl. I didn't want to look like an old man. As you go through life, you make choices. Some are good, some are bad. I'm a fan, but not you look like a fool. I guess when you are rich and famous, you can buy some good looks. Unfortunately, in this case, you should demand a refund. He sounds like a really honest, well-meaning guy, and you can't really fault him for trying to impress his wife. He's right though - warmth in the eyes is worth a lot more than tight jowls. Kenny should have realized his young wife must of fell in love with his old face & the new one looks the same age as the one he started with. The only difference i see now ,is he has a totally different & less ruggedly handsome face than what he was born with. hopefully he stays away from any more surgery & if thats what he feels it takes to keep his young wife, then he needs to seriously reconsider his options & look within his own generation for a woman . very sad! would never consider having plastic surgery for anyone or myself. U have to be happy with how u are. I still see a handsome man. Have been a fan for many many years..love your music and you. I will always love you Kenny no matter what you look like. In 1979 I postphone my wedding for a week in order to see you at the CNE in Toronto, Ontario, Canada and I would do it again. I love your looks, songs and voice.